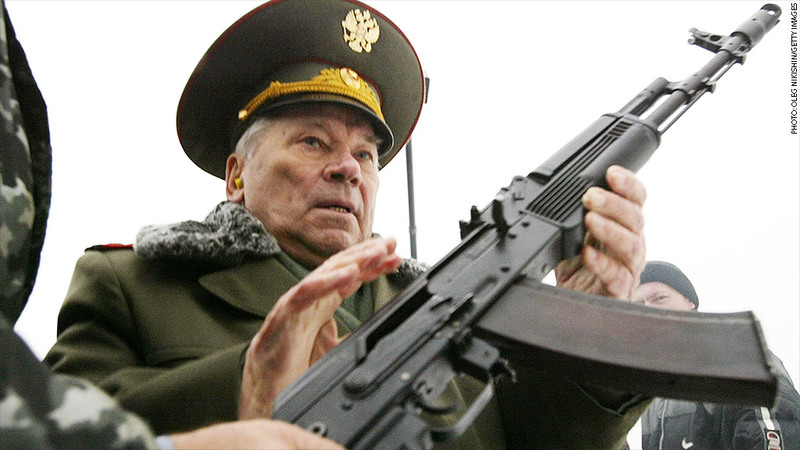 U.S. sanctions ban Russian imports of AK-47s, invented by the recently deceased Mikhail Kalashnikov (pictured here,) creating a booming market for AKs already in the U.S. Here's a surprising effect of the latest U.S. sanctions against Russia: a run on AK-47s. Among the companies sanctioned this week was Kalashnikov Concern, the maker of the automatic weapon. "We sell some of the Kalashnikov Concern stuff and that has been selling fast," said Robert Keller, manager of K-Var Corp., a Las Vegas-based online gun distributor. Keller said his company has been sold out of the guns since the sanctions went into effect. On K-Var's web site, AK-47s are listed as "out of stock." The Obama administration issued sanctions against Russian companies in response to Russia's role in a separatist movement in Ukraine. An increasingly violent civil war between Ukraine's government and the separatists resulted in tragedy Thursday, when a Malaysian Airlines passenger plane was shot down, killing 298 people. According to the Treasury Department, Kalashnikov Concern is banned from importing its guns -- including the AK-47 and more advanced AK-74 -- into the United States. But, in a statement posted on its Web site, Treasury said Americans are allowed to own, buy and sell the guns, so long as they were already in the U.S. prior to the sanctions. Keller said he is scrambling to acquire more Kalashnikov guns from U.S. distributors. He also said he still selling many weapons similar to the AK-47, such as the SAM7 brand of Bulgarian-made rifles. AK-47 stands for Avtomat Kalashnikov-47, a reference to the full automatic action of the military models, the name of inventor Mikhail Kalashnikov, and the year of its unveiling, 1947, according to "The Gun," a book by C.J. Chivers.